I can’t believe how quick the holidays came this year. Is that what happens the older you get? Each year I get older, a week is taken off the calendar, I swear that is what happens! This year I felt I was a week behind in all the Holiday traditions! However, I did manage to squeeze in five holiday parties, bake cookies, attend a December to Remember concert, keep up on my daily workouts, buy presents, wrap said presents, decorate the tree and do some DIY gifts! Whew….not to mention the pesky day job… I wish we could take the whole month of December off to play! These cookies are one of the traditions in my family. When I was younger, every December, my grandma would make ginger creams, chex mix, chocolate fudge and peanut butter fudge. All the grand kids would get a big box full of all these goodies. That’s when we knew it was Christmas time. She would put all the cookies and fudge in one of those white boxes and the chex mix usually in a leftover plastic tub from some butter or ice cream. 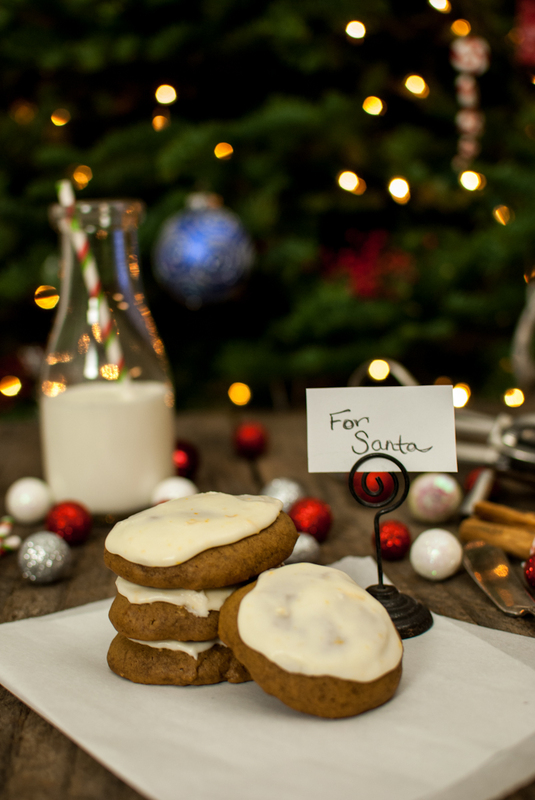 Ginger cream cookies are sooooo good, highly addicting, and full of calories…. I warned you, there. Soft and moist with warm spices and a sugar frosting, these are the perfect holiday cookie! Super easy to make to. Mix, refrigerate, and bake! 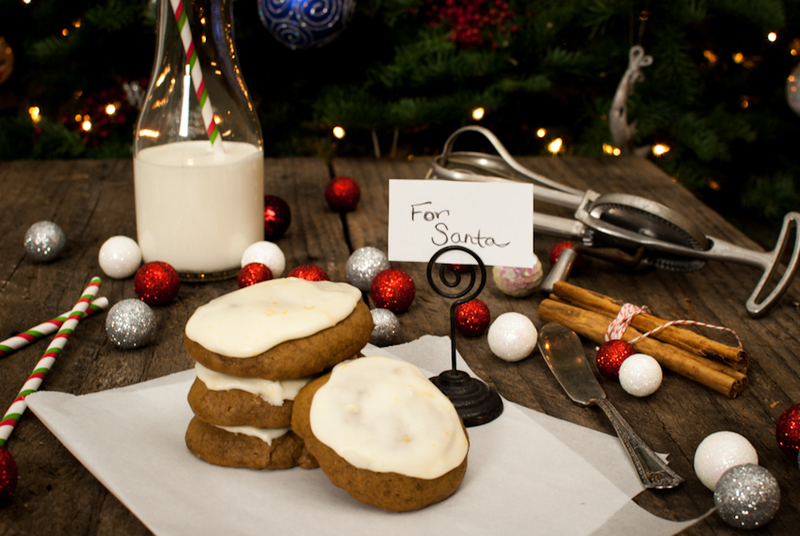 Funny thing is, I haven’t seen this recipe in any books….and then my friend was telling me about these cookies that her mom makes around this time of year, and they happen to be ginger creams! I think her and I need to get together and bake a batch of these while sipping on some holiday bubbles! What is your favorite family cookie recipe? In a large mixing bowl, cream together the shortening, sugar, and eggs. Add the molasses slowly and mix until smooth. Sift together the spices and flour, set aside. In a small bowl, add the hot water and baking soda and stir to dissolve the baking soda. Add the wet and dry ingredients to the large mixing bowl in small amounts until mixed and combined. Chill dough for 1 hour. Place a rounded spoonful of dough onto parchment lined cookie sheets, about 1 inch apart. Dough will be very sticky, I find that using 1 spoon to scoop out of the other spoon works great. Bake for 8-10 minutes. Place on a wire rack to cool. Combine powdered sugar, orange zest and vanilla in mixing bowl, add milk 1 spoon at a time until desired consistency. Keeps in an airtight container for 3 days. I totally agree Renee…ginger is soooo good! 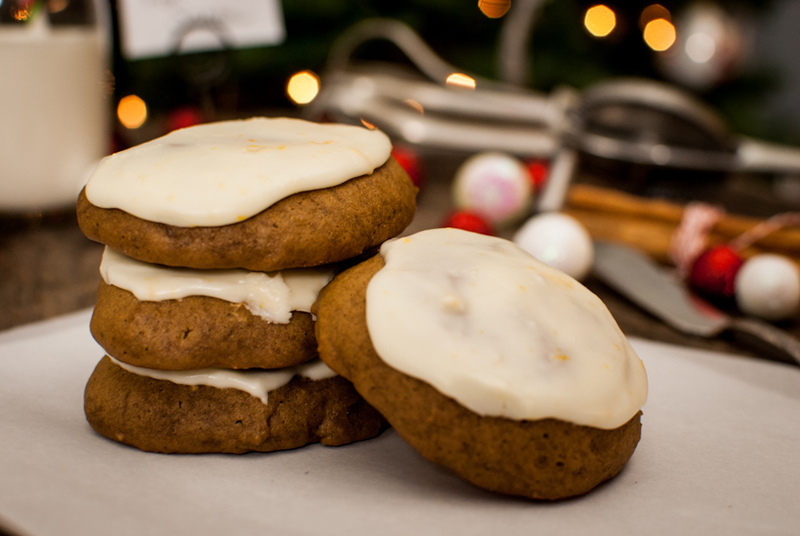 I always wish people would eat ginger cookies year round, but boy do I take advantage of it at Christmas time! Beautiful photos, and the recipe looks really straightforward! Ah, the thing I will remember most about our Grandmother…ginger creams…thanks for posting Tiff!